For Avanto 2005 we played a YOKOMONO live set with especially for this occasion made new vinyl. 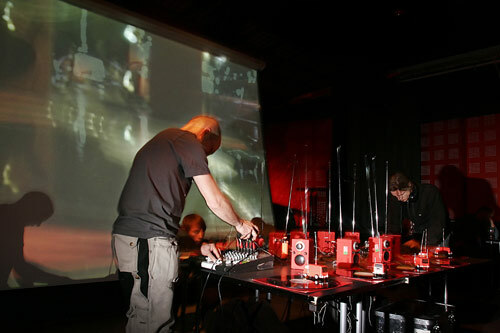 Mika Vainio, was commissioned to produce a seven-minute composition. Petri Kuljuntausta from Helsinki was, in turn, asked to provide a composition of an equal length responding to Vainio’s piece. The sound material to used for the compositions, field recordings from the turn of the 1960s and 1970s made at the Hietalahti shipyard in Helsinki, was discovered in the special effects archive of YLE Finnish Broadcasting Company. Both track were cutted parallel on one side of the record. Side two of the record presents Alexei Borisov, Andrey Kiritchenko, Blixa Bargeld, Ditterich von Euler-Donnersperg, G.X. Jupitter-Larsen, Jason Forrest, Main, Merzbow, Staalplaat Soundsystem, Un Caddie Renversé Dans l’Herbe and Zbigniew Karkowski with five loops from each featured artist and their own sound environment. Avanto is the co-producer of this unique release.